1.It is perfect for exercising, and secures in place with three extra-strength latching straps. 2.It can be worn on either the right or left leg, and is universally sized. 3.Ideal for injuries and sprains of the calf or shin muscles. Such as pulled calf muscle,torn calf muscle,calf strain and gastrocnemius tear etc. 4.Wear to warm muscles before strenuous activities or all day for constant, adjustable compression. 5.Ergonomic design allow it easy to put on,triple strap attachment combines with compression pad to provide targeted, controlled gentle compression. It is perfect for exercising, and secures in place with three extra-strength latching straps. Fully adjustable for superior support and fits either the right or the left leg. From a wide range of body types to any appropriate age and event this brace will provide a comfortable and snug fit for both men and women. 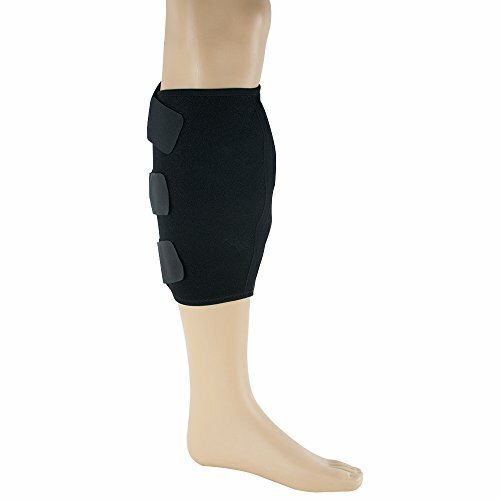 Meticulously designed to provide support to the calf and shin from former injuries such as sprain, strain, medial tibial stress syndrome and more, aid in the prevention of further injuries, and provide therapeutic compression on an already injured shin or calf sustained from athletic or occupational activities. Ergonomic design allow it easy to put on,triple strap attachment combines with compression pad to provide targeted, controlled gentle compression.